I never could have imagined I’d live here 22 years later. But here I am, working on my third year as a Texan. I’m still checking off historical items off my Bucket List and the Capitol tour looms as large as its Sunset Granite dome. So Lucy and I took advantage of a beautiful Good Friday holiday to check this one off of the list. First up is my standard parking anxiety any time I venture downtown. Fortunately, there is ample street parking in the area along with well-marked garage parking. You can check out a parking map here. 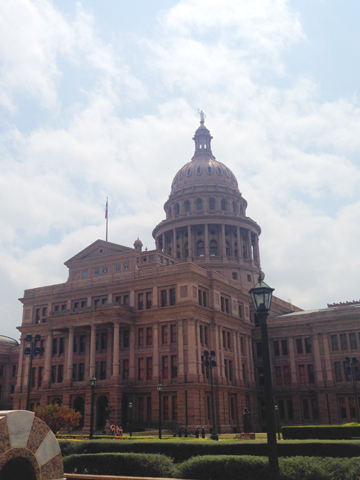 Guided tours of the Capitol are free and start every half-hour on the :15 and :45. They begin at the south entrance right outside the Treasurer’s Business Office and last about 30 to 45 minutes. Or you can pick up a brochure and do a self-guided tour but then you would miss out on the fabulous boots the guides wear; I’m kicking myself—with my not-as-fabulous footwear—for not getting a photo! That tiny star at the top of the dome is actually 8 feet from tip to tip. 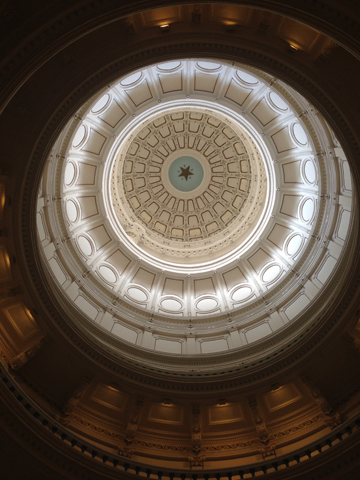 The photos of the governors of Texas in the rotunda are moved when a new portrait is installed—all four levels of portraits. 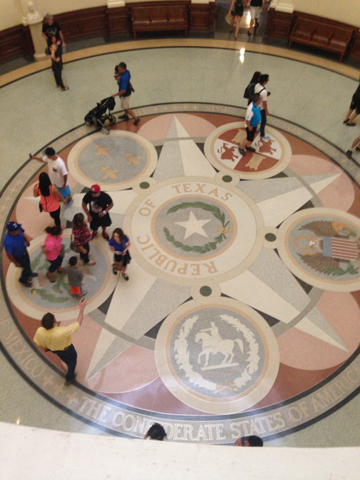 The seal of Texas is everywhere, from the floors to the ceilings to the doorknobs to the door hinges. The light fixtures in both the Senate and House of Representatives chambers are in the shape of stars. Look closer and you realize the stars actually spell out TEXAS. The bulk of the Capitol is underground in the extension that was built in the 1990s. The Texas limestone and red marble were both quarried within 50 miles of Austin. The Battle of the Alamo was not where Texas won its independence; that was the Battle of San Jacinto. Both battles are depicted in detail in paintings hung in the Senate Chambers. The only known flag from the Battle of San Jacinto hangs behind the Speaker’s seat in the House of Representatives chamber. 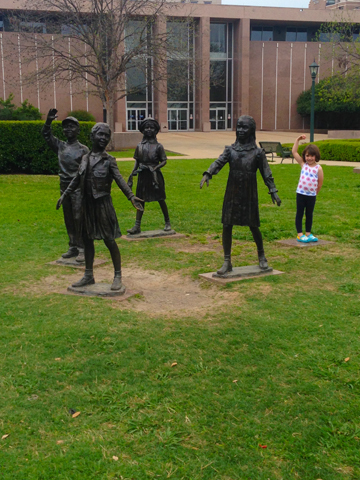 The tour lasts long enough to hold a 5-year-old’s attention as long as you arrive at the meeting spot right when it begins. There is a replica of the Statue of Liberty on the north side of the Capitol. 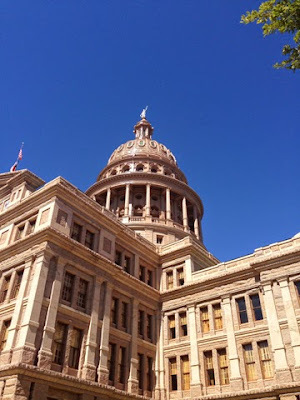 The Texas Capitol is the largest state capitol building in the U.S.,—even standing taller than the U.S. Capitol building in Washington, D.C.—proving the known truth that everything really is bigger in Texas! When we moved here, I wasn’t sure how long it would take to adjust to being a Texan. Any time I do a tour like this, I feel closer to reaching native status. With 157 people moving to Austin daily, I can only hope others feel the same sense of pride once they take in the rich history of the Lone Star State.